If you have a massive DVD collection, maybe you won't always have the opportunity to have a DVD player around to enjoy them. More often, you will want to free transfer DVDs to iTunes library freely so that you can access to the movie contents anywhere on easier devices like iPhone or iPad. Yet the process of synching movies to iTunes is not possible since iTunes doesn't accept MPEG2 format. Never mind, folow the guide and see how to transfer and import DVD movies to iTunes freely and effortlessly. According to Apple official site, the formats supported by iTunes are limited to MP4, M4V and MOV files for video, and MP3, AIFF, WAV, MPEG-4, AAC and Apple Lossless (.m4a) for audio. In other words, if you want to freely transfer DVD movies to iTunes library, you need to convert DVD disc to iTunes supported MP4, M4V or MOV first. Almost all your purchased commercial DVDs are protected by different copy protections. Those encryption measures make it hard to convert them into digital formats and then put DVD onto iTunes. By far, there are kinds of protection schemes that has disabled a large number of rippers. Choose carefully. The market is cluttered with kinds of rippers, free or paid, good or bad. Here we assume that you would want to import DVD to iTunes freely, fast and easily. Considering in conjunction with the DVD movies you may have purchased (which contains tough copy protections), many famous DVD rippers can't make the cut, including HandBrake. We use another reliable yet 100% free DVD ripping tool in this case- MacX DVD Ripper Mac Free Edition. * You can free transfer DVD to iTunes format in MP4, M4V, MOV; and also has 180 other formats available. Now you can see that process is divided into two major steps: ripping and adding. A few clicks can get the job done. First insert your DVD disc into the hard drive and also download Mac version (10.5-10.12) or Windows version (98-10) based on your computer. Click "Disc" to import the DVD. It takes no time to detect the correct title of the DVD movies. Select the output file for the ripped DVD. As we're going to free import DVD to MP4 or MOV that iTunes supports. You can further tweak the video settings like frame rate, bit rate, resolution etc to make the DVD files smaller for iTunes. 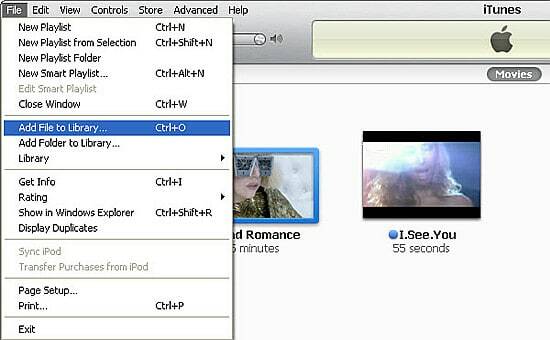 Click "Browse" to set an destination to save the output DVD video and click "Start" to rip DVD movie to iTunes now. Note 2, if you have any problems ripping protected movies (especially new titles like Disney Moana, Sing, Arrival, Moonlight etc. ), check the Safe Mode box, that will solve most DVD ripping errors. 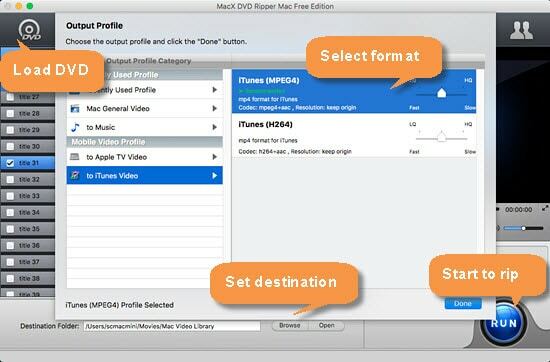 Note 3, if you want to rip all the DVDs to iTunes, including 99-title movies, Japanese DVDs, new releases and all other encrypted DVDs but has no luck with the above DVD to iTunes ripper, try the advanced version MacX DVD Ripper Pro. Having the DVD full prepared, the transferring the ripped movie to iTunes library is pretty easy. If you're new to this, just follow the steps. You can skip this step if you don't mind how the DVD cover looks like in your iTunes, or you may sort them with the help of tools like MetaZ or iFlicks. Those apps will add tags and information to the movie by scanning related cover, artists, chapter introductions and more. You just click them and the DVDs will looks just like those professional movie database. Simply drag the DVD movie from Mac Finder or Windows desktop to iTunes library. The added DVD movies in iTunes will appear in the Movie section along with other purchased movies, TV shows or videos. If you're going to watch DVD movies on iPhone or iPad, there is another step to go: manually transfer DVD movies via iTunes to iDevices. The steps are easy: connect iPhone or iPad to computer > open iTunes (the latest veresion) > select the movie you'd like to sync to iPhone/iPad > click the left sidebar and simply drag the ripped DVD movie just added to iTunes. Painfully Slow to Add DVD to iTunes? Fixed Now! When I add an .M4V file to iTunes movie section, it takes forever for the files to process. I can see the bar showing the progress of my movie being imported into iTunes, extremely slow! My iTunes library has grown to over 1 TB of music, movies, TV shows and others. It's getting slower and slower and today, it's almost unusable for me to transfer any movie content to iTunes library. If you simply want to watch DVD movies on iPhone or iPad, the fix to slow iTunes is quite easy: just skip iTunes. Rather than adding DVD to iTunes and then sync to Apple devices, the quickest and easiest way to put ripped DVD movies to iDevices is taking advantage of third-party software. Here we would like MacX MediaTrans (free download Mac version or Windows version). It will move DVD movies to iDevices by simply drag and drop. There are options that are enabled by defualt in iTunes, but most of which are not required by users. To allow a faster start when you want to put DVD movies on iTunes, you're suggested to disable them. For example, you can disable Disabling Crossfade Songs & Sound Enhancer and Look for remote speakers connected to AirTunes & Look for iPhone and iPod Touch remotes. When you have a load of DVDs to add to iTunes, you need it run as fast as it can. Therefore, you can remove Smart Playlists, which will make iTunes load movies almost instantly. iTunes automatic syncing can not only erase off your iDevice accidently sometime, but also takes quite a long time for it to response. If you're not going to transfer iTunes DVD movies to iDvcies, you can just disable it. Disclaimer: You have to know that the legality of DVD ripping of any kind varies in different countries. We do not endorse or courage any copyright infringement in any form. We only share a way that makes it easy for people to watch their purchased/homemade DVDs easily on other devices. You can only rip DVD for legal personal use and you're strongly suggested to consult your law. This best free DVD ripper for iTunes is able to free copy DVDs to MP4, MOV, MP3, iTunes, Apple TV, etc. in super fast speed and no quality loss for playback on iPhone iPad Android. No virus, spam, etc. Simple solution to solve handbrake problem. One click to fast rip DVDs on Mac macOS Sierra. MacTheRipper Not Working on Mountain Lion? Fixed! Resort to MacTheRipper alternative to rip DVDs on mountain lion. Ultimate solution to skip DVD encryption tech with nary a trouble.